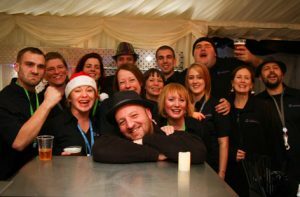 We at Events Collective are so excited to have expanded our role with the hugely successful Sheffield Food Festival and will now be taking on the day-to-day co-ordination and management of the event from 2017. We’ve been involved in delivering the festival for the last five years, so we know how well the existing model works. We want to preserve all of the successful features of the event and help it to grow naturally and organically in a way that builds on those strengths. So, to introduce the team: Bob Worm is the Managing Director and founder of Events Collective, with over 20 years experience in the industry, he will be the overall Event Manager for Sheffield Food Festival and will lead on production and infrastructure. We are really pleased to welcome Kerry Haslam to the Events Collective team, who will be taking on a freelance role as Trader Manager, ensuring continuity for our established SFF traders. Lynzi Bartrop will be Production Officer for the event ensuring all goes smoothly on the weekend. Clare Collister is our Finance Manager and will be dealing with all invoicing and administrative issues. And finally, Laura Holmes will be providing overall project management for the event, keeping everything on track and in budget.